Final Fantasy XV has attracted a lot of attention over the past year, but it's the fourteenth entry that could prove to be the biggest success story in the long-running franchise. The MMO is perhaps tarnished by the failure of its original incarnation, but back in August Square Enix announced that the launch of new expansion Stormblood had helped drive Final Fantasy XIV's player base to over 10m, encompassing both free users and subscribers. That's only 2m short of the 12m active subscribers World of Warcraft enjoyed at its peak, closer than any other MMO has come to surpassing Blizzard's opus without resorting to a full-blown free-to-play structure. Glory is within the team's grasp, but director Naoki Yoshida remains firmly grounded in his ambitions. "That's much higher and further away to reach," he tells GamesIndustry.biz. "We respect [Blizzard] and we do of course want to catch them up, but we want to take it one step at a time. I don't think we're at that point just yet." Like WoW (and pretty much any remaining premium MMO), Final Fantasy does have a free trial and Yoshida reiterates that the 10m achievement encompasses those accounts as well. While he is unable to detail the split between paying and non-paying users, he is proud to say "our active subscribers is the largest it's ever been." Even without knowing exact numbers, a growing userbase of paying subscribers is no small feat in this day and age. With so many free-to-play options available, convincing MMO users to invest in their adventures is becoming tougher - a challenge Yoshida recognises all too well. "We respect [Blizzard] and we do of course want to catch them up, but we want to take it one step at a time"
"You never know what you're going to do the following month," he says. "Everyone has a busy schedule, you never know how much game time you can put into the following 30 days, but we're asking for our customers to pay for those 30 days in advance, so it is something that is an obstacle. The hurdle is pretty high." So how is Square Enix convincing so many people to pay for an MMORPG, a genre that many in the industry would have you believe is dying (if not dead already)? 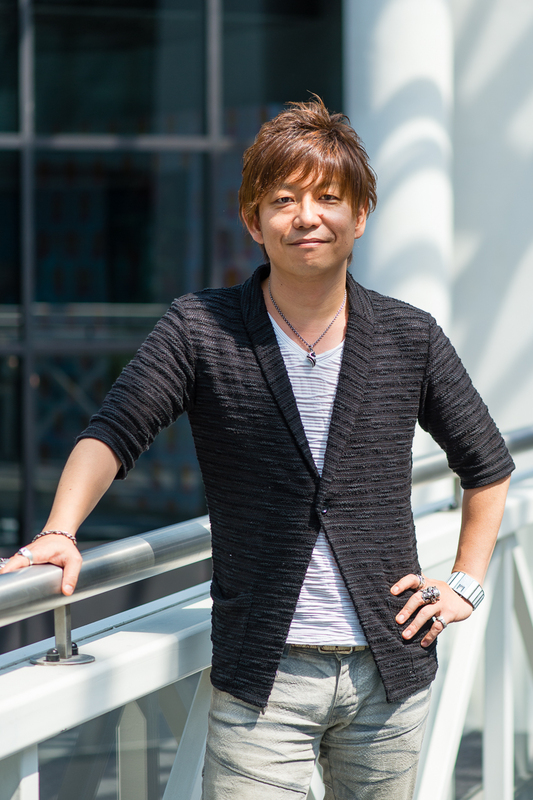 In Yoshida's eyes, FFXIV subscribers are paying for the quality of service: reliable servers, regularly updated content and "a fairly substantial volume" of editions with each patch. "It seems like something that's second nature," he acknowledges. "You might think 'of course you have to provide that', but being able to provide and deliver on that continuously makes that difference." Final Fantasy XIV also employs a neat tactic in convincing players to subscribe. Most MMOs make themselves free up to a certain level - in World of Warcraft, for example, that cap is level 20. While level arcs vary from game to game, FFXIV's seems higher and therefore more generous at level 35. But it's what happens before this cap that's the real selling point. At level 20, beating a major boss battle earns them the title Warrior of Light, and NPCs recognise this status throughout the game's world. At level 30, players change from a class structure to one based on jobs - a staple of the Final Fantasy series. This opens up an entirely new progression path that free players only have five levels to explore. "The free trial ends right about there, where your big adventure is just about to start, so it makes the players want to see the rest. It's designed that way"
"The free trial ends right about there, where your big adventure is just about to start, so it makes the players want to see the rest. It's designed that way," Yoshida explains. "When we release our next expansion, we might consider opening it up to let people play until Level 50. I want people to at least try to get a feel for the game, and then I'm sure they'll want to continue playing." It's a strategy that clearly continues to work. Few MMOs today are able to justify a subscription model (in player's minds, at least), but the quality of XIV and the prestige of the Final Fantasy franchise makes this model the most appropriate to Yoshida and indeed Square Enix. "That being said, if 80% or 90% of our players are demanding we go free-to-play, then we might need to look at shifting our business model," he says. "But we would also need to change our game design to match that business model. It all depends on what the game design should be based on what our players' needs are." The Final Fantasy brand is not an insignificant factor in XIV's success. The 30-year-old franchise predates Warcraft and almost every other MMO on the market. You might think activity from other titles in the brand help to drive players towards XIV, although Yoshida tells us he "hasn't seen a direct impact from" the success of FFXV. "If 80% or 90% of players demand we go free-to-play, we might need to shift our business model. But we'd also need to change our game design"
Instead, it's the cumulative goodwill towards the Final Fantasy franchise and the expectations past titles have created that have driven the team to build an MMO worthy of the name. As such, product quality and narrative scope are the true key to its appeal. 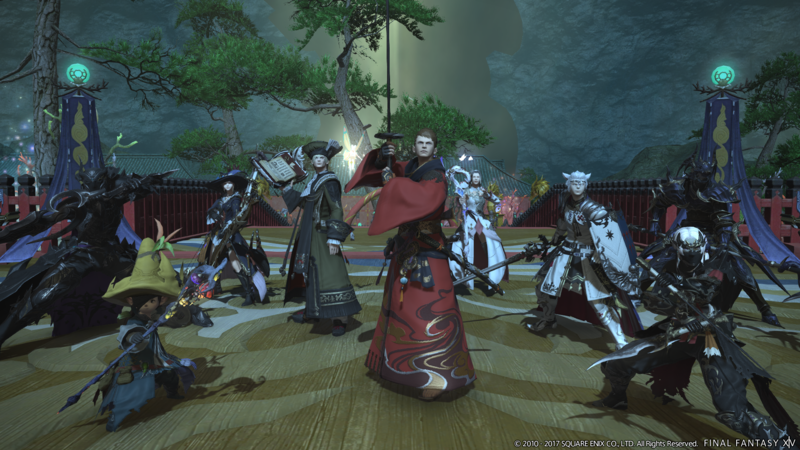 Story, in particular, is something XIV aims to excel in. Most titles in the genre are built around forgettable narratives easily lost in the disorder of mindless fetch quests, repetitive combat and foraging, and other mundane tasks that drain context from the gameplay. Yoshida says this is not the case with the Final Fantasy MMO. "What we do in XIV is something that isn't really done in other MMOs," he says, "You only really need to go through the main story quests to progress in the game. There are certain dungeons and boss monsters you'll be battling, but it's all incorporated into the narrative. You can enjoy this as a standalone RPG, and it just happens that the parties you join are other players. "Even if you go out and try to hunt the monsters in the field, I don't think you'll be gaining as much experience as you would going through the main story quest." He continues: "With [most other] MMORPGs, the surrounding lore is very well established and then you have the settings that surround the realm you're in, but there's not really the concept that the player themselves are the hero of a story. We have to have a good story because this is Final Fantasy and that's the foundation we go into when creating this game. That's the difference, the fundamental difference between a typical MMORPG vs one that's rooted in Final Fantasy." The manner in which that story continues is also instrumental in not only retaining players but selling each expansion. 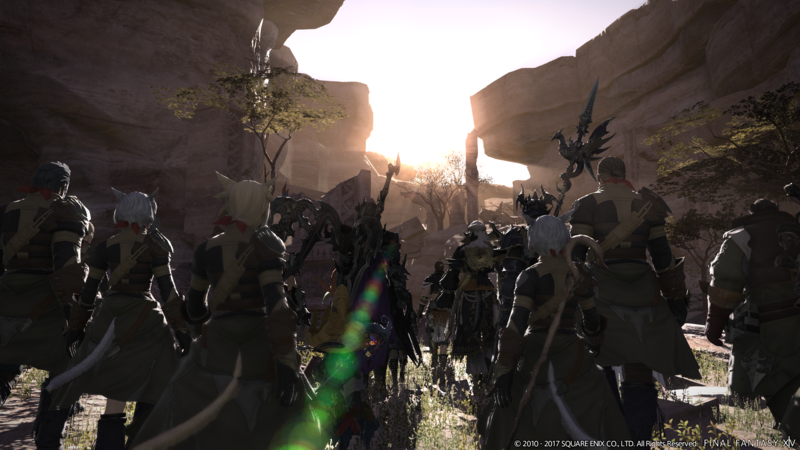 While some other MMOs treat expansions as a comprehensive add-on that almost introduce a standalone package into an established world, Final Fantasy XIV's packs are intrinsically linked to everything that has come before them. "We look at each expansion as a new season in a TV drama," Yoshida explains. "When we first relaunched with A Realm Reborn, that essentially became the first episode in our 2.X series. Our patch update schedule is to roll out a major update every three and a half months, and our 2.55 patch served as the finale for A Realm Reborn. "With that finale, we had a large cliffhanger that connects to the next expansion, the next season. So with Heavensward and the 3.X series, we went through the subsequent season, building on it with the various patches. Then we released Stormblood and entered our third season, so we continue to update and expand the story through our major patch updates and lead up to the following expansion to begin another season." The analogy raises a potential problem when it comes to new players. If you're late to a TV show, binge-watching the previous box sets is a task far more achievable than catching up on three years' worth of MMO quests. Fortunately, Yoshida and his team have taken this into account when preparing for the flood of newcomers Stormblood proved to draw in. "Our active subscriber base has become the largest it has ever been, so we haven't reached that plateau yet. We haven't peaked"
"With Final Fantasy XIV, we want to make sure you're not left behind, even if you stop for a while," he says. "The game design is structured so you can always catch up to the more advanced players. "We've designed it so that when we release new season episodes, we go back to earlier ones and make adjustments so that brand new players can catch up as quickly as possible. For example, you can gain three times as many experience points on the older quests so that you can level up quicker by going through the main scenario quests. There's no need to deviate to the various side quests - you can just plug through with the main story and strengthen your character that way. The best gear is distributed throughout those main quests so that it's smoother to move forward. "We make those adjustments to make sure new users can catch up with the more advanced players. Stormblood, our season three, has only just come out, but if someone starts the main quest of season one, they should be able to catch up to Stormblood at a fairly rapid pace." 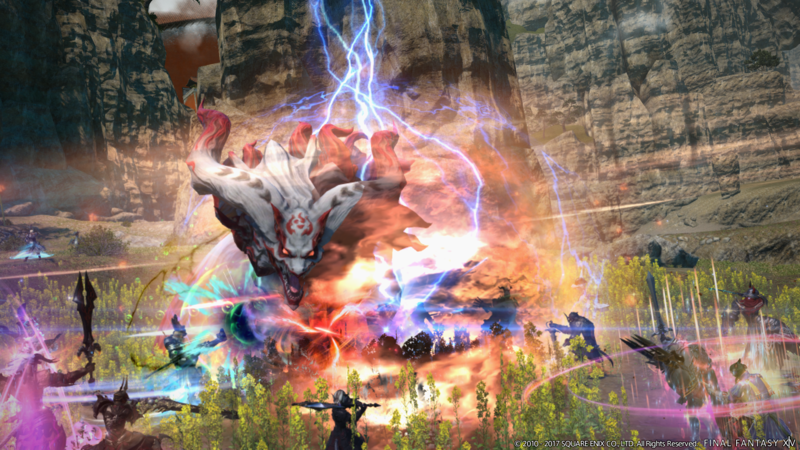 The last expansion also introduced a new item called Tales of Adventure that, when activated, marks all pre-Stormblood content as completed, enabling players to simply press on with the new quests. This works hand-in-hand with a previously established system called Unending Journey: when players retire at an inn, they can watch previous cutscenes from A Realm Reborn and Heavensward in order to get a recap of the story so far. It's a smart system that makes a new expansion as accessible as possible for anyone that has yet to dip into Final Fantasy XIV - although one that has not proved to be as essential as Yoshida initially thought. "Maybe our existing players have told them it's such a waste to skim through the narrative of A Realm Reborn and Heavensward, because we're not seeing as many people utilising these Tales of Adventure items," he says. "It seems like people are aiming to go into Stormblood by playing through the first two seasons." Just as a showrunner needs to think about the future of his TV series, so too does Yoshida need to consider how long he can stretch out this narrative - particularly as continuing to play eventually requires a subscription. So how many 'seasons' does the director have planned? "I would like to continue operating Final Fantasy XIV for 10 years," he says. "That's the clear image I have in mind. Now that we've passed our fourth year, we're aiming for that 10-year mark. In terms of how many expansions we'd like to release, it's not clearly determined just yet but if the title is successful, it would be nice to release an expansion every two years or so. We're gradually making preparations to plan for future expansions. He concludes: "With the release of Stormblood, we thought we would reach this sort of plateau period as an online service but we were surprised to see so many new players coming in as well as returning players coming back. Our active subscriber base has become the largest it has ever been, so we haven't reached that plateau yet, we haven't peaked, so until we reach that we just need to focus on continuing to push forward."